Julie talks about making a cowboy quilt for her dad. She took inspiration and images from both her dad’s and her trips to Arizona, as well as making blocks with names linked to the theme. Julie talks about the practicalities of making the quilt, and how much it is appreciated by her day. One third into the interview Julie starts to explain her background in sewing and crocheting as a child, and then how she came back to sewing after her mum died. Later Julie talks about completing an Adult Education course in quilting and her involvement in the quilting community, her role on The Quilters’ Guild committee and as a member of a quilting group. Other topics covered include designing quilts, quilts with a message, and quiltmakers who inspire her, as well as how important quilts in to British life, modern influences on quiltmaking and group quilt projects. 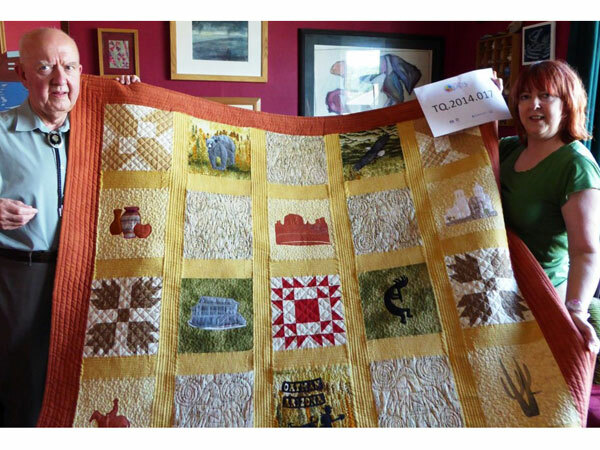 Nicky Ryden [NR]: This is an interview for Talking Quilts. It is Friday 11th July, my name is Nicky Ryden. I am going to be talking to Julie Edwards. 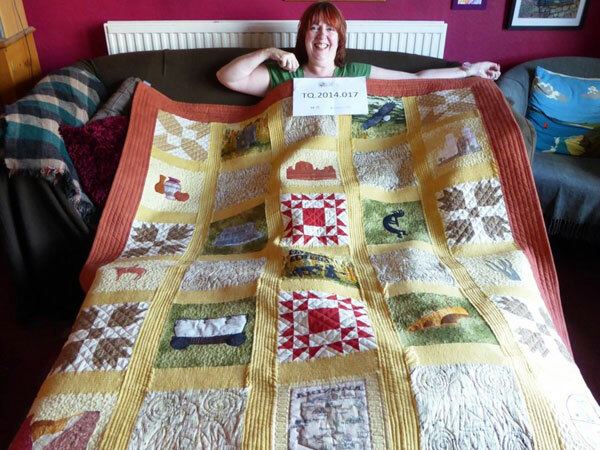 We are at my house in Skelmanthorpe, West Yorkshire and Julie is going to talk about a quilt that she made for her dad. Julie Edwards [JE]: I am, that is right. NR: So would you like to tell me about the quilt, Julie? JE: Ok, yes. My dad started going to America in 2004, my mum died in the Christmas of 2003, and they never used to travel very far, but there is a bit of my dad that’s always been a cowboy at heart. He had been reading novels, he was introduced to novels as a boy, of a novelist called Zane Grey who wrote contemporary westerns. One of the things that my dad decided he wanted to do, he wanted to go and see the mid-west. He booked himself onto a trip, he then found out there was a Zane Grey West Society in America and made contact with them and they said ‘Do you know we have a convention every year?’ So he went on his fantastic trip around the Grand Canyon and went into Arizona. He then [adjustment of microphone] decided to go back for a trip to the convention, the Zane Grey Convention. He met so many people and was bowled over by their generosity. They then rebuilt, in a place called Payson, in the middle of Arizona, Zane Grey’s cabin. He said he wanted to go and help out there and he became firm friends with the people in Payson. He now goes twice a year, once a year to the Convention, which is all over America, and then for four weeks or the best part of a month to Payson in Arizona were he goes and helps out in the Zane Grey cabin. JE: And everybody in Payson seems to know my dad [laughter]. I had been… I started doing sewing again, I suppose for me it was after my mum had died, and there was something about it which was for me… deciding I wasn’t going to put off doing things until I retired. Because my mum was only 68, which wasn’t very old and one of the things she said to me was ‘I thought I’d have some more time’. I thought, I used to really enjoy sewing and craft work, and did some basic English paper piecing years ago, and I thought I’m going to start doing it again. I can say more about later about what I did and what I learned. My dad really like some of the work I was doing and said ‘I would really like you to make me a quilt’ and of course I wanted to make him a quilt. I’d probably been quilting about four years or five years at this point. He said I want it for my bed, I want it to go all down the back and the sides and I want it to be mainly pictures [laughter]. At which point… having done a few blocks it was like OK this is going to be real challenge! Although I really wanted to do it, because I have to say I am so proud of my dad, for having just picked up and started a new life for himself. He did not let himself, you know, I suppose ponder on the stuff that’s difficult, because I know how much he misses my mum, as we all do, but he has decided to go on a different adventure and it is fantastic. I did end up, actually after I had done the quilt, two years ago I went with him to Payson, just for two weeks, he stayed then for another two weeks. He kept saying ‘Oh I wish you could meet my friends over there, they’re just wonderful.’ They were wonderful people and to see some of what he was doing, were he goes and some of the things that I put in the quilt as well [laughs, NR: Fantastic!]. It definitely was a labour of love. I realised it was going to be a very big piece, [laughs] it is, well its over 6 foot by 5 foot. My dad wanted the colours of Arizona, which is very much the kind of yellows and the… yellows, greens, browns, the kind of reds as well. That kind of, kind of ochre. I then sat down with him and we tried to talk about what he would like incorporating. He gave me a lot of images of Arizona, the Zane Grey Cabin where he helps out, Kokopelli, which is a famous little character, I can’t quite remember the story about Kokopelli, he plays a flute and I think he’s something to do with fertility. [NR: Right] Definitely very much a symbol of Arizona. He gave me all sorts of inspiration, bears, pottery, the Grand Canyon, the amazing saguaro cacti, which when I went over I could see how many of them there were. But knowing that it was going to be a big quilt and I didn’t want it to look too kind of plain I decided the only way I was going to make it look cohesive was to put some pieced blocks in, I knew there was a block called ‘Bear’s Paw’ and I found another block called ‘Arizona’ and there’s another block in here that I can’t remember the name of, but I will let you know. Then also to have, I suppose not quite plain, but it wasn’t a pieced block, I found this amazing fabric that looks almost as if it like arrowheads [NR: Yes] with greys and browns. That’s Monument Valley [showing images of quilt on iPad] which is right at the top end of Arizona, and you will see it in lots of the old westerns. NR: Oh, with these wonderful rocks? Rock stacks? JE: Yes, which is amazing, again my dad bought some beautiful pottery that the Native Americans, though interestingly he said ‘They call themselves Indians’ [laughter]. So we can’t possible call them Indians but they often do. That’s the Zane Grey Cabin [showing image of cabin]. NR: Gosh, it’s quite elaborate isn’t it? JE: It is yes, it’s beautiful. I had to put a cowboy in for my dad. There’s a place called Oatman, and that was from a postcard with the old prospector and his donkey. I made that as a silhouette. JE: Again, how do I do it, how do I then attach it, I did use Bondaweb, but then of course I had to stitch it down as well. That’s Kokopelli playing the flute, the eagle of course [showing blocks on iPad]. That, I think it’s called the San Xavier Mission and I think that is in the southern part of Arizona. That’s one of the saguaro cactus, and when I went there with my dad I was amazed, there where hundreds, well thousands of them and some of them are absolutely huge. I think they grow a straight pole and only after about, I’m sure it’s about 30-40 years when they start to grow the arms. JE: An elk or a moose! All of the kind of picture ones I transferred, I scanned in the photograph and then put it onto fabric. JE: I just bought the sheets of fabric. A covered wagon of course, and I think that was the Grand Canyon, I found some of the interpretation really hard. NR: I think it is so impressive Julie, such attention to detail as well. JE: Well I wanted it to be, I wanted to get it right for him really. Oh and that one there, that’s in the Grand Canyon at one of the towers, again I did go to the Grand Canyon with my dad, I was looking forward to it, I choose the only day it rained. JE: I saw a lot of mist, and bits of the Canyon, but I have seen that, that was actually on the wall in one of these towers. They look like ancient monuments but they were built in the 30’s apparently, if I remember rightly. I did enjoy doing it, but it was a challenge, it was so big that I knew I wouldn’t be able to get it all under my sewing machine and I did want to do the quilting myself, so I decided to do it in strips. I would say I cobbled that process together, I tried to leave a gap in the quilting but if I look at it now, ohh I should have gone further along and I’ve come across new techniques about joining, ‘Quilt as You Go’ methods. So I would be using those methods more, I think I just thought I’m going to do it, I can do this I’m sure I’ll manage. But my dad doesn’t mind that at all. The blocks which are just one piece of fabric, one fat quarter, with this arrow head design I quilted the,… it’s called Thunderbird, it’s a symbol that’s very often, it’s like a … linked to the Eagle. In fact my dad started wearing the, I can’t remember what they’re called now, the little thin ties that look like a string? JE: He’s got one that’s got a Thunderbird symbol on that, but I did find that in a book of Native American designs in the library at the Quilt Museum. I went and spent some time there a while ago. The only comment my dad did make and I just roll my eyes a bit, he said because of how I had transferred the pictures and bondawebbed things, of course they were back to front [laughter] And it’s like ok, thank you dad! JE: But he loves it. NR: I am sure he must do! JE: He so loves the quilt, he has it on his bed and he sleeps under it. Of course when it’s very hot he has to roll it up, it weighs quite a lot. I used a lightish polyester just because if it ever needs to be washed then it’s possible. So that’s lovely, he has it on his bed and he sleeps under it and he has shown pictures all over the place. It’s probably the most challenging and complex quilt I have ever made, certainly the biggest one I have made. NR: Just thinking about how you had to capture all of those images and find ways of transferring them onto fabric. I think you have done an amazing job. It’s really fabulous. NR: Really fabulous, much loved, treasured and well used. JE: I think I said in my, when I was writing my… I think it was supposed to be for one, for a birthday, that’s May, but ended up being Christmas. NR: Well, I think that’s not bad! That’s only seven months behind schedule [laughter]. JE: I have got other quilts that have been several years in the making or finishing! In the finishing I should say. NR: I guess you had quite a sense of achievement when you completed that, having overcome all those different kinds of challenges. JE: And just doing things like making sure I washed all the fabrics, how they were going to work together, what threads I was going to use, I went through spools and spools and spools of one thread, because there was a lot of stitching, when you are quilting as well. NR: Wonderful. What did you do for the backing? JE: I’m just trying to remember what… I think it might be the same backing that I used for the sashing, it was very similar and then I made a label, I did a grid, a table out on the computer to show the location of each of the blocks and what they were called. I put a little bit about, I put the name of the quilt, what it was about, made for my dad, then I printed that out onto fabric, a fabric sheet and that is stitched onto the back. NR: So really good documentation. JE: I always say to people please make sure you label these quilts, even if it’s something little it’s important. NR: That is a lovely story of a quilt. NR: I think it reflects something about quilts that is quite unique in the sense of why we make them and who we make them for and what goes into the making of them. JE: Yes, very often very often it’s about that personal touch. I wanted to get it, if someone asked you to do it you want it to be right for them. I have made some quilts for other people and its thinking about what would they like, what colours would they like, what kind of design would they like. There is something beautiful about giving a quilt as present. NR: Thank you. That’s is very moving, the whole story. What started your interesting in quilting? JE: I learnt, it was my dad’s aunt who, think I was about twelve and I went to stay with her, as you used to go for a holiday, and there were two things she taught me that holiday. One was to do English paper piecing, the hexagons, and the other was to do crochet granny squares. I came back home and I did quite a bit of that really, I think we had also got… when people came to stay, me and my sister used to go in the spare room, we also had, it was a throw, it wasn’t quilted, it was a hexagon coverlet, that I think this great aunt of mine, aunt of my dad’s had made. When I came back, I must have been about 12, 13 then, it was all the fashion to have bean bags. So I remember over the next few years doing lots of sewing, doing crochet squares, and I made two bean bags one for myself, like a floor cushion. One floor cushion for myself and one for my sister and we both took them away to college with us as well. I suppose that was really the last bit of quilting that I did until 2004. So that would have been, gosh probably about 1975, although there must have been something like that. Although I must have done something in between because I do remember in the mid 80’s Laura Ashley started selling all those packs of fabric, and my house had. As loads of peoples did, in the duck egg blue and peaches. I bought all sorts, I bought a whole pack of hexagons shapes and a whole pack of squares when they were all reduced, half price I think they were. JE: I think I bought more than one pack, I think I probably bought several packs. And I obviously started making a top, but it got put away for years and years and years. So that must have been the mid 80’s and then of course you have children, we’ve got two children. I remember knitting things for them and I think I made a couple of dresses for my daughter, but a lot of that just goes. As they have got older I have taken on different jobs, fulltime, also the other thing I’ve done is bits of training and stuff, all sorts of those kind of… so I really didn’t have… really picking up anything in terms of creative stuff actually. Looking back now I can’t believe, why wasn’t I doing, what was I doing in that time [laughs]. I know I was working and I was a mother, and I was involved in other organisations. I’ve always been someone who gets involved. But given how much pleasure, it is so important now, and how much pleasure I remember it being, always making things. Thinking why didn’t I? Then, as I said, My mum became ill at the end of 2002, she had ovarian cancer. Initially she was well, then she relapsed and then we knew she wasn’t going to get better. I just had all sorts of conversations with my mum, about things she wished she’d had more time to do ‘I thought I would have a bit more time’, she kept saying ‘I thought I would have a bit more time’. So even though she knew she wasn’t going to get better, she somehow thought it would be longer process. And it just made me reflect on how, all the things that I’d said, I’ll do that when I have retired, when I don’t have any responsibility, when I don’t do that.. After she died, a) You are dealing with the grief yourself, I also had an undiagnosed thyroid, under active thyroid, as well; so I had a really difficult year. I went to see a friend of mine and she just did this little picture with bits of organza, stitched together and I said, I thought that looks fun. Very nice. So I went to John Lewis, you could buy then 10 centimetre strips of organza. I started doing little cards and little tiny pieces, then I got a bit more. Then I went to charity shops and got some more fabric and then, literally it is less than a mile from where I live, I found this shop ‘Patchwork Garden’ and it was like, oh! That looks an interesting shop! It had been there for several years by this point, unbeknown to me. I went in there and it was just like opening the world up. I signed up for a class, a workshop, that she wasn’t teaching, but someone was teaching. I thought I fancy doing that, I often tried to a night class of different things. I’d done sewing, I’d done jewellery making, I did, oh what’s it called? Dancing, tap dancing one year! I always tried to do something and there was one for patchwork and quilting. Again it was about a mile away from where I lived, so I signed up for that, and it was great. I found out that the person doing the day workshop at Patchwork Garden, was the woman who was going to be the tutor for the course. I went in thinking I know what patchwork is, [laughs] but of course it was you will need a rotary cutter and a cutting mat and a ruler and it was like uh! I remember going in the shop and saying like, you need to choose a medium, a dark and a light and all… and it was like, I was like a rabbit in headlights [laughter]. What do you mean? What do you mean! I remember having this angst trying to choose these fabrics. That was the back end of 2004. Never looked back since then. NR: Going strong ever since! Wonderful! How many hours a week do you thing you spend quilting? JE: It varies, I have to say it absolutely varies, if I get an hour a week that is quite a lot. Some weeks I haven’t done any, and other weeks I’ll try and do quite a bit, depending if I have got a deadline coming up for something. Every now and then I think I must do a little bit every day, I did sign up for the Contemporary Quilt, for the journal quilts, and that was like one piece a month. I did that for about three years and then the final year I just got so busy I couldn’t do it. Although I have finished them and they are going to go in Festival of Quilts this year. I would like more time, I do try to make time. NR: Life kind of gets in the way doesn’t it? Particularly if you have got quite a demanding job, I think. JE: Yes, yes. When things are busy as well, I will go through lulls, I suppose if a I reflect back I probably have done quite a few bits, whether its small bits. Work were having a raffle and someone said could you do us something? And I thought well, I’d done these cushions that I’d partly screen printed but they weren’t right, so I undid them and then I started to do some appliqué on top and then put them back together. And there’s another one because my daughter was saying ‘Oh it’s my friend’s 30th birthday and blah, blah, blah and I’ve not got any money’ and I said oh what would she like, would she like one of my cushions, (laughs), so if I think about it I do do bits and pieces. But I would like to do more. NR: Yes, well, when you retire! [JE: Yes] [Laughter]. I think you have already said about your great aunt being a quiltmaker, and introducing you to it, but do you have a first quilt memory that pre-dates that at all? Is that…? JE: I guess it would be this coverlet that we would often try to sleep under when we had family over. NR: … and you moved into the spare room. [JE: Yes] [laughter] Do you think your quilt making impacts on the family? JE: I think my husband would say it does, [laughter]. He sometimes, because I am also involved in the committee and everything and have been, you know, with the Fat Quarter for a while I think he sometimes feels ‘Oh you are going quilting again!’ So yes, in one sense I think it does, the other sides of it is, I think he certainly, he is very supportive actually and he does like the pieces. I do laugh, my daughter tends to live away most of the time, although she is back with us at the moment, and my son has been mainly living there, and our son, I sometimes ask what do you think of this and he rolls his eyes at me as if to say its mother again why is she asking me about a quilt? [Laughter] They know it’s my passion, they know how much I enjoy it. Carmen, our daughter, she did go and get, for my birthday one year, she did go and get some little charm squares. She’d obviously gone into the shop on her own and I was very touched by that. So they all know what a fat quarter is now [laughs]. They all know patchwork is one thing and quilting is another. NR: They haven’t taken it up? JE: Yes, you never know. NR: I think you belong to a quilt group, I guess that is probably quite an important element of support and a place to talk about your quilting. JE: It is. 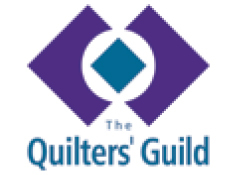 Totley Brook quilters, I joined Totley Brook quilters when the Quilting, the Adult Education course came to an end. I did it for four years, and it was at the time when you had to show progression, so they had to. You weren’t examined but somebody would come and have a look at the work etcetera. A fantastic tutor who is now a really good friend, Carolyn Gibbs, Carolyn and I we go to Festival of Quilts together and we’ve been to AGM’s. She was trying to find a way, she developed four years’ worth of stuff so you could stay and then she got a job, I think. They were closing it down anyway, and at that point I thought where am I going to get my… because I really enjoyed sharing and discussing thoughts, so that’s why I joined Totley Brook Quilters. Now there’s three of us from that who are on the Regional committee as well. Last year, me and my husband we got married after 29 years together we decided we’d get married. So two other people and Carolyn came to our evening do, so there are people that I’m very close to in the group. We set ourselves challenges, it excites me that we have actually got a piece that is going into the Festival of Quilts this year, a group piece which is also 3D. NR: Oh! [Laughter] Sounds exciting. JE: A fish mobile, so we do have different kind of challenges and every two years we tend to have a bit of a show. It’s nice to feel a sense of other people who share my interest. In fact there is even two women from work who now go to the group as well. NR: So the word has spread! [JE: Yes] [laughter]. Would you like to say a little bit Julie about the work you do for the Guild. I know you have touched on that in passing, the regional committee, but would you like to expand on that a little bit? NR: So you are going to be very busy with that. JE: We are going to be very busy (laughter) But again it’s been meeting lots of new people as well and erm, that one of the things I think, it’s so friendly, I know a lot of people but I happily go to shows on my own all over the place because I know that I can sit down and have a coffee and I can talk to anybody because we have got that common interest. NR: Yes, and people love to share don’t they? Whether its look at this wonderful piece of fabric I have just found or about a technique, or anything! Quilters tend to be very generous I find. JE: Absolutely, so it’s wonderful really. NR: It sounds as if it is really a very valued part of your life in a sense, perhaps without it life would not be quite as rich. JE: I think that is so, and I think for a couple of reasons really. One it is a lovely antidote to my day job in the NHS. That’s not that I don’t like what I do there but, certainly in the role I’m in now it’s a lot of long term things and there’s a lot of challenges that are going on there at the moment and I suppose patchwork and quilting is what keeps me sane. I can relax, its therapeutic, if I make small things you get that sense of completion. Making something for somebody else, there is something that’s really…it’s totally different. Also, I hope this is not disrespectful to anybody, but I am on the younger end of a lot of people at quilt events and shows, not the youngest, but the younger end, but one of the things it has given me is a really positive view of getting older. That may sound strange. NR: Life doesn’t end at fifty! JE: Absolutely not [laughter] I think there’s something very heartening for me about that anyway. [NR: Yes, yes.] I know at one point there was a bit of me thinking, the therapist in me, not a substitute for my mother, but mixing with older women, was there something about that kind of bond that is important. [NR: Mmm] If I think back, my paternal grandmother, my dad’s mum, she was a very feisty lady, who I had a lot of time and respect for, it’s interesting. NR: Yes, I think that is an interesting point and I can kind of identify with what you are saying there, I wonder if it’s partly an antidote, in a sense to erm… the kind of cultural stereotypes that we have, you know that once you are no longer employed or employable then you don’t have a role or a contribution. As you say there is the Guild or other people you are involved in creating wonderful pieces… [JE: Absolutely] you realise it’s just not the case [laughter]. So it’s a very interesting point I think. [Pause]. Are there any aspects of quilt making that you do not enjoy? JE: Probably the basting up, tacking together, [laughter] which I think is why I tend to do smaller pieces than big pieces. I have one piece that is half tacked that’s hanging over our bannister and I have another piece that is all English Paper pieced, the top is finished, it’s a Laura Ashley pack from 1985, [laughter] but I eventually found that I had finished the top, and its double bed sized, I’ve got the squares that I am just going to machine for the back, to make a backing, and I just know, you know, putting it altogether. Although I did at this year’s AGM I did see a lady who was demonstrating using batons. NR: Yes! [Laughter]. I thought that was wonderful, I saw her too! I thought mmm! But you just have to have a big enough table to do it on. JE: Yes, yes, I’m trying to think how big our table is… yes. When it comes to doing that one I think I am going to have to… I find crawling around on my hands and knees not at all comfortable, tiring on my back, tiring on my knees. I think I will do more ‘quilt as you go’ now because you can at least manage much smaller pieces until the very end. That probably the only bit I don’t like. I like machining, I like hand doing, I like slow stuff, I like fast stuff, I like experimenting, but layering the quilt up and basting it together. NR: I’m with you there! [Laughter]. You said that you like doing a whole variety of things, but do you have a particular technique, that’s one you keep coming back too? JE: I do use quite a lot of fused appliqué, and sometimes, if I have got very beautiful pieces of fabric, I will just do a very simple block, and that can be done fairly quickly, I quite like Log Cabin but I do still love English Paper piecing. I have at the moment on the go, some diamonds that I am making into stars, that I started when I was in hospital, which was six years ago, and every now and again I get it out and do a bit more, that’s like a colour, its dark reds, purple browns yellows oranges and it will be a hanging size, all the bright stars are against black. There is something that I find really relaxing about hand sewing. NR: There’s something rhythmic, isn’t there that’s quite soothing? What about technology, do you use any technology? I think when you were talking about your dad’s quilt you mentioned copying and transferring onto paper and things like that. Do you use any other aspects of technology? JE: I haven’t done so far, I certainly do like doing a design and print it onto paper. It’s interesting because my husband, he dabbles in digital art, printing a piece out, and I’ll say you try printing that out on fabric and I’ll stitch into it. I would be interest to do some more of that. I quite like doing, I haven’t got one, but I have had some done, thermo fax free printing. I did a couple of courses with Ineke Berlyn and she’s got the facilities to do a screen, I quite like that because you can print something up and then stitch into that, that’s easier than the old fashioned screen, cutting pieces out and so on. I have a Janome, I don’t have a fancy computer, I know that there are some that do all sorts of designs and things. I do love my iPad, [laughs] for taking pictures and for it being instantly there. NR: Yes, that accessibility is really nice. Do you have a special place to work, a studio or sewing room? NR: Wherever you are… Yes. Do you have a design wall? JE: I don’t, I don’t have a design wall, but I can improvise, I bought a piece of flannel. I think I did a Kaffe Fassett workshop years ago, so a flannel sheet. I put it on, you know those coat hangers, the one you use for trousers. I hang it on the back of the door, so I can display long thin pieces [laughs]. Somebody said you could put strips of Velcro along or on top of a shelf unit. I did do something, when I was trying to look at something biggish, I put it over and put the books on top of it so it could hang down [laughs]. You find a way round. NR: Yes, yes. How do you design your quilts? Do you have a particular way of doing it? JE: I suppose I have an idea in my head, depending on what it is I’m doing. If it’s a straightforward block quilt, then I will just try and work out how many blocks it needs. I will sometimes, I’ve been encouraged to use sketch books and that tends to be when I’m doing a particular course. I love to look at peoples sketch books and I will try and jot something down, but unless I’m doing a course I don’t have the discipline of sampling things. I think it’s partly because I don’t have the time to be playing around, so I do sketch things out and I found a book a while ago, where I did sketch, oh I’ve got an idea for a quilt! They are still there, but if I’m doing something particular, then I will do but it tends to be fairly small scale and just for the… rather than, I’ve got an idea, I’m going to develop it and try things out. NR: How much do you spend on quilting? JE: [Laughs] Well… probably at this time not as much as I did, partly because I spent so many years buying every bit of fabric, fat quarters, under the sun, you go to the Festival of Quilts and ‘oh, that’s a bargain, I’ll have that’ and ‘oh this is really nice and that’s really nice’. So I have a huge amount of fabric, not quite I’ll never run out but I have a lot of fabric, so this last couple of years I have thought I don’t need any more. There is no more fabric I need. I will sometimes buy very special pieces of fabric. I love, and she’s always there at Festival of Quilts, Heidi Stolwether, she has the most beautiful hand dyed cotton sateen. They are not cheap, they are expensive but they are absolutely beautiful, the vibrancy of the colours. She will often do a pack together, so I nearly always treat myself to one of those. I’m building up a collection. I’ve run out of room so I’ve moved onto threads, to buttons, [laughs], beads, [laughs] and books. I love books. NR: It can get quite costly can’t it? NR: So perhaps it’s as well not to add it all up! JE: There are definitely some years when I have spent a considerable amount, yes it’s good not to add it all up! NR: Its always there, it doesn’t go off, you can always use it. [Pause] Thank you for that. I’m just having a quick scan down this list to see if there’s anything we haven’t talked about – I think we have covered all of that section. If we move on to thinking about craftsmanship, design and aesthetics, what do you think makes a great quilt? JE: From my perspective I think what makes a great quilt is, it’s one that strikes you, you are immediately taken by it, so there something about it, whether it’s the colour or the design that really draws your attention. Then when you look at it a great quilt is one that is executed well in some way, shape or form. It’s not necessarily that everything has to be perfect but there is a sense of quality in the work. Sometimes I’ve looked at something from a distance and I’ve thought oh that’s really good and I’ve got nearer and I’ve thought mmm, you know? [NR: Yes.] That’s not to say they are not valid in their own way, and I think it’s really important, because I’ve heard people say when they go to quilt shows, oh I could never enter anything because everything is so wonderful, actually its really good to see the whole range of techniques and abilities and qualities of people who do some stunning pieces, that are absolutely immaculate. 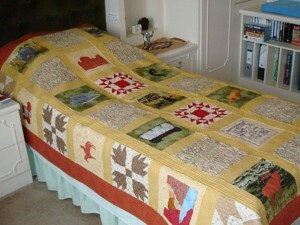 For me a great quilt is one that really has a wow factor, and then when you get close to it still has that wow factor. NR: What about an artistically powerful quilt? JE: It’s difficult, I love art and the same thing, in an artistically creative quilt as in an ordinary piece of art. It would have something that spoke to me in some way. So I know that there have been quilts that have got messages and sometimes, some of those I have really liked. There was a wonderful quilt, I can’t remember the series, she has, I think they are of her body I think it was. She’s done lots of quilting, a lot of it has that message, I think she was ill, and she was aging and there was something powerful about those. Not necessarily what anybody would want to see on their wall, but there was something really interesting and artistic. Another thing in some quilts, yes there’s an artistic message there, but it’s almost too in your face and I have thought well why is that a quilt? It’s a hard one, in the same way there are some pieces of art that I love and others that I don’t. I do tend to be on the drawing and painting side, I loved, and he’s coming to Yorkshire Sculpture Park, I loved Ai Wei, Wei and the little sunflower seeds. I didn’t get to see them, but I would have loved that, I thought there was something very beautiful about that. And Anthony Gormley’s ‘Field of the British Isles’ I think it was called. That again, I saw at the Sculpture Park, which I was very moved by. There was this little room, with all these people. I think for it to be artistically meaningful in some way, it varies such a lot. NR: Yes, different messages for different people. JE: I suppose in terms of quilting what would be important was that somehow that the medium of the quilt, of textiles was somehow connected with it. So you see some things and its why, that could just be a painting. But if there is something that is about it being a texture, a textile piece that means more. NR: It’s interesting isn’t it when you begin to think about the meaning of quilts, how they can be taken in various directions? JE: … and also they are, after people like Tracy Emin and Grayson Perry have been doing things. I know that it can be quite controversial, the Grayson Perry one that is in the new, that Tracey Chevalier curated exhibition that is all around abortion and things. There is something about a quilt that is still quite appealing even where it had a very powerful message. I think it’s interesting that people who are known artists and then they do some textile work and the acclaim that is given. I think that is the same with ordinary art as well. JE: What becomes a flavour for the day can be for all sorts of things. NR: Yes, you are absolutely right and twenty years later people might look at it and think mmm. Do you think there is anything particular that would be appropriate for a quilt for a museum or a collection? JE: If it was for the Quilt Museum, something that is maybe unique, that’s a different technique or if it was one of a kind or it included a very rare fabric of some kind. Or for a particular purpose, I don’t know how they judge the things that they do accept into the Quilt Museum. I have sometimes been and thought those are a bit samey, but obviously there is probably something that is important. I’m not sure, I think for any other kind of museum it would be nice to see more textiles pieces in them. NR: It’s an interesting question isn’t it? [JE: Yes] Is there any particular quilt maker, who you tend to think of as a great quiltmaker? Who influences your work? JE: I like the work of, but I could never get to her standard and I could never be Philippa Naylor, I love her use of colour, her precision and her, you know she’s pushed some boundaries in taking traditional quilts in a different way and they are immaculate. I did a workshop with her and she went through what she does, and I just thought I can see why you win prizes. You will work for six months solid and every piece will be matched and traced and colour washed. Exquisite! I love looking at her pieces. I mentioned Ineke Berlyn, I like her work, for its freshness. I’ve not seen much, more recently, I know she has moved into doing a lot of other things as well. I have really enjoyed doing… she is a lovely teacher, very generous. I really enjoy doing workshops with her, very, very encouraging. Some of Janice Gunner’s, those three are probably key people. I’m sure there’ll be somebody else I will have missed out [laughter]. NR: You mentioned doing workshops with Ineke, could you say how those people have influenced your work? Or have they influenced your work directly? JE: I suppose, of the people I have done workshops with, I’ve tended to find its either pushed me into exploring things differently or I’ve said that was very nice but I’m never going to do that again. So for example I did a workshop, after I got the money from the Sue Belton memorial prize, and I did one day with Kaffe Fasset, at the Festival of Quilts. Really enjoyed it, I did learn quite a lot, a very different take on, you know having done the thing on light, medium and darks, his take was about blend and flow and using lots of pattern. I learned quite a bit about that, I wouldn’t want to do a lot more of it. I think with things like Ineke, we had, I’ve done things like work books and trying to experiment and doing that, using different techniques and thinking, thinking about what I am doing a bit more, encouraging your own design. Carolyn Gibbs who taught me, gosh, she is one of the best teachers I think I’ve ever had. Her work is very traditional, she’s a very traditional quilter and I do love some of Carolyn’s pieces, but we always laugh because she knows I’m not like going right down that route, but again it was being inspired to try and do the best, learn the basics and then look at applying them differently. If I think about how I use colour now, I do love using colour and different techniques, then I suppose they have all stretched me to try different things. To never stop learning, for me it’s about keeping, even if it’s something I would never do again. 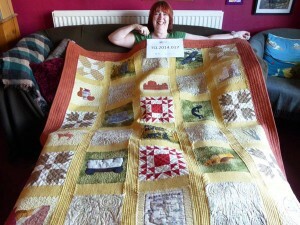 I did something last year at the Festival of Quilts with sheer fabrics and glue, oh dear me! It was like, okay, I’m not doing this again! [Laughter] I have done something with erm, I did a workshop with Ferret, I think it was, it was like a swan, my swan was all blue. I loved doing that, tiny little pieces of fabric. NR: So it’s perhaps about people who encourage you to stretch yourself, the idea, develop your own way of using the technique. Ok, right, quilting machine or hand? JE: Both [laughter]. I’ve done more quilting by machine, I have done quilting by hand, I’m not very good at it, so I would like to do a bit more. I did fall in love with Colonial Knots. I made a cushion, did a workshop with Sandie Lush and really fell in love with Colonial Knots and did it at one of our regional events. I made a couple of ring pillows, I made a ring pillow for my wedding, so I do like doing stitching by hand, I’ll do little pieces by hand, with some basic stitching. I love big seed stitching, I do like doing that and even if I have done some machine pieces, I will sometimes put a bit of hand stitching in. When I was doing the quilt for my dad, and other quilts like that it will all be machining. But if it’s a simple, small hanging or a small pictorial piece or… I will often put a bit of hand stitching in. NR: And would you use a longarm quilter. JE: I have never, I think I had a go with one once, I wouldn’t. I don’t know. I guess if you had access to use one you would learn, but I can never see myself doing that. NR: Would you have one of your quilts longarm quilted? JE: I don’t know, I suppose I have mixed feelings about it, they can look beautiful and some of the designs are fantastic and obviously all that side is taken away from you. For me it’s like, if it’s a quilt I’ve made it should be a quilt I’ve made. That’s a personal thing. It would have to be for a very particular reason that I had it long arm quilted. It’s not something I think I would do. NR: Quilt making is obviously important in your life, can you say why? JE: I think because it is that antidote, to… it’s a de-stressor, it is totally different to the NHS. It’s not about my family, so I suppose it is another, it gives me something else in my life, but the main thing is a sense of achievement, it’s fun, it’s a destress which is relaxing and its lovely to make beautiful pieces, it’s the feel of it and the look of it, colour. I am one of those people who go ooh I haven’t seen this fabric for a while, then put them all back again [laughter]. NR: It’s kind of quite exciting, you never know where you might go. JE: I find something and think I forgot I’d done that piece! NR: Yes, it’s a creative outlet, it satisfies the need to be making things and to have beautiful things in your life. JE: Yes, it’s definitely about making something beautiful, and thinking, I’ve done that, created it. NR: Do you think your quilts reflect your community or region at all? JE: I don’t know as they do, just thinking about, we have had some regional challenges that have been about Yorkshire and things, so there are a number of ones that are around that. I do a few of what people might call quirky pieces, I do like to put a bit of humour in if I can. It depends on what it is. We had a challenge for Halloween, I think it was, and don’t ask me why but I found one of the kids, they were called ‘Funny Bones’, books and there were television, there were books and they were on TV and they were like skeletons, there was this big skeleton, little skeleton, so I decided I was going to make a little 3D skeleton! I drew it all out, got this horrible brilliant white satin fabric for the skeleton, lovely in terms of colour, but an absolute so and so to sew. I was going to join it with bradawls, so that it would move and things! JE: It is quite funny and in fact I hang it up in the window at Halloween [laughter]. So there is a bit of me that quite likes quirky. Yes, we had to do Easter, Easter Rabbit or something, once and it was like ‘I don’t do cute bunnies!’ So in the end, I had this mad, zany fabric and I did this cool dude, this big rabbit with sunglasses [laughter] because I couldn’t do the face! There is a bit of me that’s kind of quirky. NR: Do you think quilts are important in British life? JE: I don’t know how much quilts are, I think, there is the history and people seem to like the history of quilts. So when people find there is a Quilt Museum, they are interested. Then they go round a historical house, the V&A exhibition and others. So I think there is something that resonates with people about quilts. I think for me it’s more about the process, the fact that we’ve always done quilts, so quilts have always been made, and quilts are still being made and in a way that’s what is exciting, that actually people are still making quilts, sometimes for functional purposes, as well as for decorative purposes. For me that is what’s exciting. Also I guess that is why I think it’s really important that we try to have, as well as our heritage of quilts, we should try to showcase work that has been done in the last fifty years. Where are the quilts of the 50’s, the 60’s and the 70’s? I’m sure they were being made, I don’t know how many, and the going forward. I think it’s the process, I do think that creative activities, particularly sewing and textiles has become much bigger again, you only have to look at the television, The Sewing Bee, Kirsty’s do dah, whatever you might think about it at least its brought an interest. [NR: Yes] It was funny when I was thinking about this, it is a therapeutic activity, I think it’s also a reaction to the massive mass production. [NR: Yes.] You know, everything being regimented, everything being plastic and everything being throw away and I think people do like making things. I think it’s interesting because I think there’s more and more men who are now making things as well. It’s also, not that men can’t make quilts, but generally there do tend to be some activities that men don’t engage in as often. There is something about a reaction, I was reading something, and I can’t remember where it was now but it was saying that at the beginning of the 20th century, I think it was the 20th, it might have been the 19th century, there was a big revolution, it might have been in the 19th, that the Arts and Crafts Movement, that grew out of a reaction against this very mechanised, industrialised… it was interesting, a lot of it emerged at the beginning of the century. I was thinking about how things have grown since 2000 really, in all the arts, crafts, textiles, creativity, handicraft, it’s just suddenly blossomed. Shops that weren’t around, the websites, fabrics, designs, it really has taken off. I think what’s interesting is that it may be a reaction to that but also at the same time technology had taken off, and what’s exciting is that now people are putting those things together. The number of times I go and there are people there with their iPads or their phones, or making notes or taking down designs. NR: So, and that I guess contributes to an international community doesn’t it? JE: Social media as well, Pinterest, Etsy, Facebook and all, you know, blogging, twittering, I don’t know about twittering. The Guild website, I have got a page on there that I try to put things on, all of that is about making, there’s that sense of community, people sharing patterns and ideas, Oh I like that! That’s far more… I think that’s really interesting because of all the very creative home, the crafts and arts and things, then there’s technology and that’s… It’s an interesting mix of everything we do. NR: Do you think about the future, what do you think might be the biggest challenge confronting quiltmakers? JE: Thinking about quiltmakers, trying not to think about things for the Guild, I guess it will things start to tail off? What will that be about? Once we weren’t doing things, it’s wasn’t as big because there wasn’t the resources to do it, there wasn’t the sharing. I didn’t know anybody else who did patchwork and quilting until I got to the shop and then the class. So maybe there is something about the fact that we do have much more connections across the city, country, region, world, that will keep that interest going. Or it might be one of those things, something else will become the flavour for the day. I’d hope it will never go back to being quite as it was, but you don’t know really. So I think it will be the trends really. I know from the Guild’s perspective that they are thinking we have got an aging membership and how do we get the new people? I think that is a challenge. Buts it’s also about what do the new… people are still doing it, people are doing patchwork and quilting, at all ages now, so people are getting involved. They may not become members of the Guild, they may do, we don’t know that one. [NR: No, I know.] Money is always an issue, but I think you can do a lot without a lot of money. NR: Yes, you don’t have to spend a lot of money, do you? You may chose too! [Laughter] but you don’t have to. Thanks Julie that was really, really interesting, I’ve come to the end of what I wanted to ask you, but is there anything else that we haven’t covered, that when you were thinking about this session, that you might want to add? Anything that you want to say? JE: I don’t think so, other than, as we’ve been talking I was thinking of another biggish piece that I was involved in putting together. That was, and I suppose I was thinking about it because it was about the sense of community, it was a colleague at work, in fact she used to be my boss, she was at the point when she retired, and she retired, and somebody else in the organisation had this idea, about let’s make her a quilt. They said, Julie’s very good at quilt making, maybe she can help us to do this, which was like ‘thanks for the idea!’ The idea was to do a block, we wanted lots of people in the organisation to do this, which was fabulous, but knowing what I know, it was this could be uncontrollable. So I came up with the idea of colours, in the end people had four options, so I gave them a background piece of fabric, or they could make squares, they could do a nine patch, or there was another block they could do, or they could do a sewn appliqué, or fused appliqué, or they could take a background block and do something on it. Or they could write, I has some fabric pens, because by this point we had 101 people in the organisation, all saying they wanted to do it including people who had never sewn in their life. [Laughter] So basically they had six options to choose from, they then had to tell me, so I cut everything out, they told me what option they wanted and then I would give them the pieces. It was hilarious, because then I ran some mini workshop in my lunchtime, for people who hadn’t done, some people said just give me, I’ll do that it’s not a problem, took it away with them. I know what I’m doing just give me the background block. They could understand, do not sew anything a quarter of an inch away from the edge. JE: Yes [laughter]. It was absolutely fantastic, we had the Chief Executive of the organisation, the Chair of the organisation, the non-executive directors, the Director of Finance, a big guy, he used to play rugby, other people who had never sewn in their lives, they were all coming, you know sneaking in Julie can I have a word. The Chief Executive coming to me and saying Julie, can I negotiate for an extension please? I said well that’s a turn-up for the books. I get on very well with them and I know the Chief Exec, it was really, there was something that was fun. He was saying I got my builder doing this with me [laughter] I was getting, I couldn’t work out which design I wanted to do! So there was something about the whole community of people that came together to do this and then I put all the blocks together and quilted it. NR: That is such a lovely story. JE: It was fantastic and she was so thrilled with it, boy was it a challenge to do that! It was funny because of all those, these people who were seen as big important roles in the organisation, sneaking in and saying can I have some help. Surreptitious emails going round. It was enormous fun I have to say. I was cursing trying to get it finished for the final deadline. It was big. NR: Quite a challenge for you as the person trying to co-ordinate it. JE: Particularly when you had to do things like, a knitted square. JE: Or something with lots of beads on it [laughter]. NR: Yes. But a stunning leaving gift! JE: Yes, oh yes, she so enjoyed it. 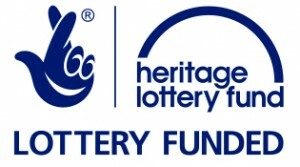 As we were talking about that sense of community that did feel like a real community project, that people came together across the organisation, people who’d never ever done anything like it and they were so delighted when they saw it. I can’t believe my piece is in that. It was just lovely. NR: Which is another whole different story isn’t it? I don’t think we had better start that one. NR: Thank you so much Julie. NR: It’s been really interesting. JE: I don’t often get time to talk about quilts [laughter].